Fun Christmas theme days for school are used for winter spirit week, holiday spirit week, Christmas spirit week, or even incentive days to bring fun and celebration to the holiday season. Choose one theme day to host right before your school's Christmas or winter break, use a different theme each day for a week, or go big and try 12 different themes for the 12 days leading up to break. Many preschoolers love to dress up so theme days are most exciting for this age group. Choose themes the kids can pull off on their own or with a little help from a caregiver. Plan lessons and read books that match your theme for the day. 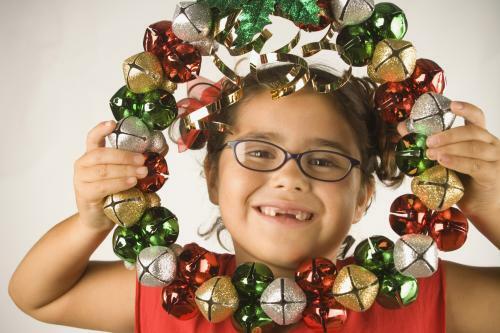 What could be more fun for little kids than running around making a jingling sound all day? Since bells are nondenominational, this day works for any group of kids. Wear as many or as few jingle bells as they'd like all day long. Signal transitions throughout the day with the ringing of a bell. Plan lessons about famous bells such as The Liberty Bell or STEM activities like making your own bell instruments. Play "Jingle Bells" on the announcements at the start and end of the school day or carol through the halls singing Christmas carols about bells. 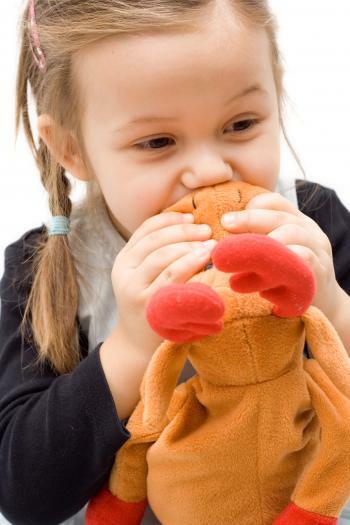 Three-and-four-year-olds love their stuffed animals as much as Santa loves and needs his reindeer. Give every child a small stuffed animal reindeer to carry for the day and keep. Plan a fun art project where kids can color in a reindeer then give it a name. Dress like reindeer by wearing a costume or dressing in all brown. Have kids gallop like reindeer everywhere they go for the day. For some kids snow is a novelty and for others is normal, either way it's fascinating for children in this age group to have a winter theme day. Dress in all white, like a snowman, or even like a snow globe. Do typical snow day activities at school such as watching movies, drinking hot cocoa, or having an indoor fake snowball fight. Use fake spray snow to let kids decorate the windows in your classroom. Create a snow sensory bin using real snow, fake snow, or tiny styrofoam balls. Forget ugly Christmas sweaters and celebrate Ugly Backpack Day! Kids can use Christmas decorations to decorate their backpack like a Christmas tree. Use removable wall hooks to hang decorated backpacks in a Christmas tree shape for the day. Let kids wear their empty backpack around for the whole day. Ask administrators to vote and hand out awards for "Most Creative," "Ugliest," and "Prettiest" backpack. This is the age where kids take writing letters to Santa very seriously. Celebrate this momentous occasion as a group. Wear your Christmas wish list by writing it on a plain white shirt or pinning a paper list to your shirt. Invite parents and caregivers in to help kids write letters to Santa then ask the local mail carrier to pick them up. Have kids take turns role-playing Santa and how he might answer all of their letters. Plan an art project where kids use holiday themed tape to decorate pencils and Christmas stamps to make their own stationary. Since little kids love dressing up and the mystery of Santa, combine them into a secret agent Christmas theme day. Dress up how they think Santa would look if he was wearing a disguise. Make a DIY photo booth where kids can use Christmas themed props to disguise themselves in pictures. Ask a few staff members to dress in Santa costumes then play a game and have kids guess who is hiding under the costumes. Assign each kid to be a Secret Santa to another child then ask them to slip secret pictures into each other's backpacks. Teach children about the religious period between Thanksgiving and Christmas known as Advent with a Colorful Candle Day. Dress all in one color typically used for an advent candle like purple, pink, blue, red, green, white, or gold. Plan a craft project where each student gets to make an advent wreath. Have fun with science and make your own candles. Create a classroom Advent calendar to count down the days until Christmas. Children in grades K through 2 still want to have lots of fun, but are now able to participate in more complex theme days. 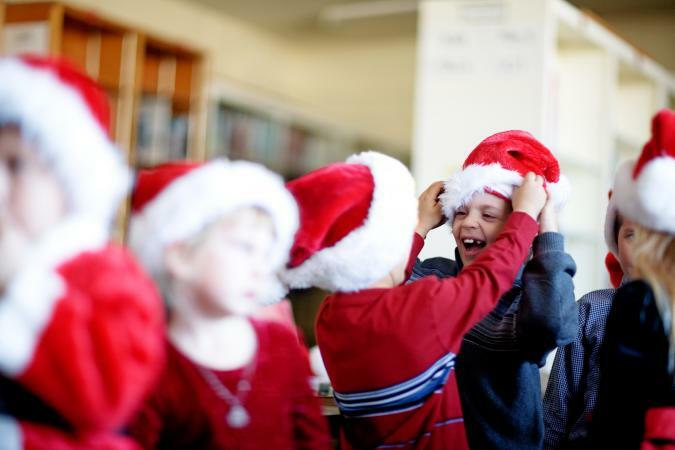 Turn your classroom or school into Santa's workshop full of elves! Dress up like an elf. Make cards or small toys to donate to people in need. Set up stations like Santa's workshop such as building, painting, and packaging. Embrace the iconic holiday nutcracker for a non-denominational celebration. 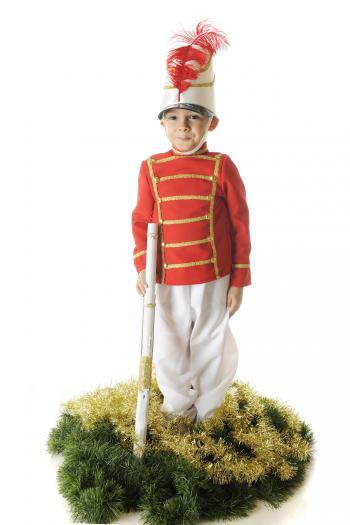 Dress in toy soldier costumes or ballerina costumes like characters from the ballet The Nutcracker. Build wooden toys or paint your own blank wooden nutcracker. Plan a history lesson about when nutcrackers were invented. Give kids a day to feel like the gifts they are. Use ribbon and wrapping paper to create an outfit that makes you look like a present. Host a gift wrapping party where you wrap presents for people in need. Give each child a small gift to open. Take inspiration from your favorite picture books about Christmas and the famous song, The Twelve Days of Christmas. Dress up like your favorite Christmas book character or one of the items from the song. Choose 12 Christmas books to read. Have kids make lists of the 12 things they think the school or the world wants for Christmas. One magical element of the holiday season that transcends nearly all religions and beliefs are lights. Wear clothing or accessories that feature lights such as light-up sneakers. Do a fun science experiment with light or electricity. Hang Christmas lights in the classroom and turn off all other lights for the day. Use characters from the movie Rudolph the Red-Nosed Reindeer and the Island of Misfit Toys or popular toys for kids in your class for this theme. Dress up like your favorite toy. Plan a lesson about how toys have changed throughout history. Ask every child to donate a new or used toy you can give to other needy kids or schools. Celebrate the birth of Jesus with Nativity Day. Dress like a character from the Nativity story. 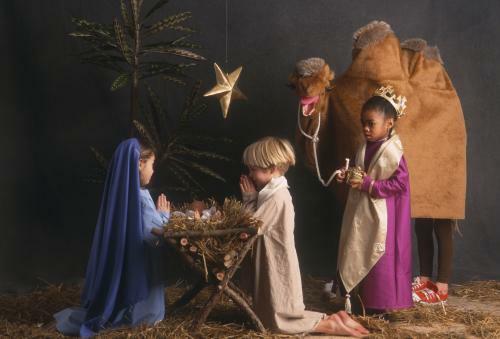 Have kids perform a play about Jesus' birth. Invite local church officials to tell the story of Jesus' birth. Kids in this age group may or may not believe in Santa Claus. Keep their interest with opportunities to celebrate the holidays in new and funny ways. Just like Jack in The Nightmare Before Christmas, kids can mix two holidays together to create something new. Dress in a costume that represents both holidays you chose. Write a how-to manual on the specifics of your new holiday. Create one tradition for your new holiday and share it with the class. Give Christmas carols the respect they deserve with a day dedicated to them. Dress up as the personification of a Christmas carol and see if other can guess your song. Go caroling through the school, a nearby hospital, or town. Split kids into groups and have them write music and lyrics for an original Christmas carol they'll teach the class. Christmas wreaths often show the beliefs and personality of their owners. Use these iconic decorations to celebrate in a secular way. Create a holiday wreath day that shows your personality and favorite aspects of the season. Wear it as a necklace for the day. Have each class create a giant wreath that represents their class. Hang them on classroom doors. Make live wreaths then hand them out at a local nonprofit organization. Angel trees are meant to help kids in need get gifts for Christmas. Celebrate the season of giving with your own version of an angel tree. Have each kid write down a few simple things they could do for others and hang these from their shirt as a form of an angel tree. Others can take one from any child and the wearer has to fulfill that task. Start a school angel tree in the lobby that features supplies and items your school really needs. Plan an art lesson where kids can make small cone-shaped angel trees for decoration. No matter your age, there is something magical about Christmas. Use a magical theme like Harry Potter to celebrate the magic of the season. Dress like your favorite wizard, witch, or magical creature. Like the Weasley family tradition in the books, learn to knit or crochet something with your initial on it. Plan Christmas related science experiments throughout the day. If you want to teach different holidays for the winter season, start with the first day of winter. Dress up like an ice queen, Krampus, or another symbolic figure from Pagan winter lore. Since it's also called the Celebration of Light, use only LED candles to light your classroom. Help kids encourage wellness for the Planet Earth by making edible bird feeders or cleaning up a park. Learn about the guiding principles of this cultural celebration with a themed day. 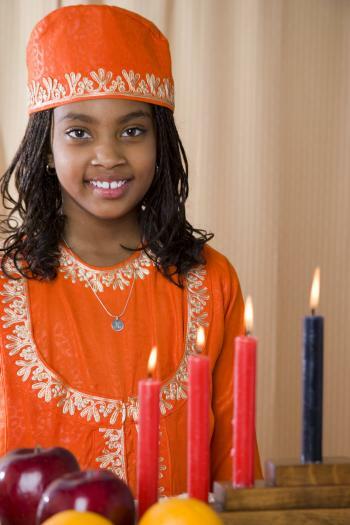 Dress in the colors of Kwanzaa: black, red, and green or wear traditional African garb. Incorporate the seven principles of unity, self-determination, collective work, cooperative economics, purpose, creativity, and faith in your lessons for the day. Serve a Kwanzaa buffet lunch that includes okra, black-eyed peas, yams, greens, and peanuts. 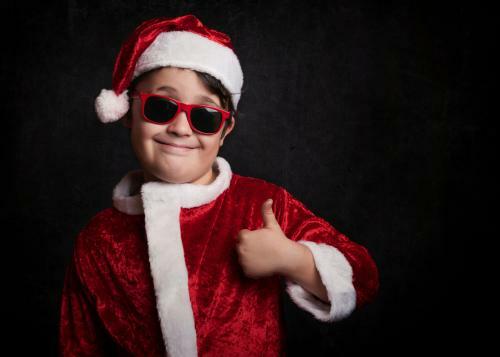 Your school and students are unique, so get them involved in choosing themed days to dress up and celebrate during the holiday season. Change up your themed days from year to year to keep kids excited about these special events.